Declan completely changed the layout of the room, installing a full drum kit and an 8ft X 6 ft mirror on rollers. One table was piled with that weekend’s Nationalist newspaper and two other tables were doubled up and left with Neva’s beer bottles, hair and badges and my strips of yellow fabric. He invited Alex Pentek to collaborate with him playing the drums occasionally throughout the performance. 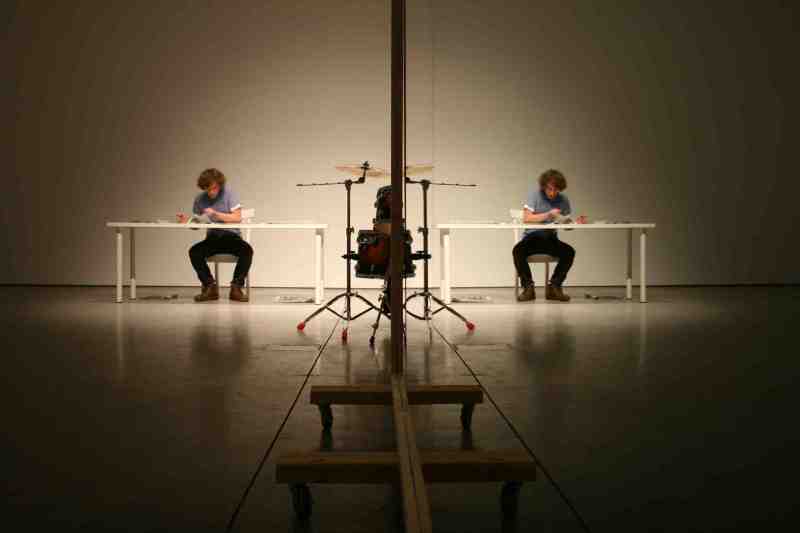 At intervals Declan rolled the mirror around the space, confronting the audience with their own image and fracturing our perspective of the room. The heavy and cumbersome mirror knocked into furniture and walls occasionally threatening to topple chairs and tables or knock into the feet of audience members. On placing the mirror at a certain point he then sat at the newspaper filled table black pen in each hand and X-ed the heads on photographs of people in the paper. Approximately every hour Alex came into the room and started drumming, rhythmical, jazzy beats while Declan silently and intently moved the mirror around, showing us broken and backward images of the drummer. The room and the past performances detritus shifted and were half captured in the mirrors reflection. Playing with our perspective of what was in front of us, the moving mirror dynamically confronted us with a cubist like framing of the reality of the performance. The pace of the moving mirror changed throughout the performance, often slow and laboured but sometimes faster creating a cinematic spin as objects, audience and artists flew past themselves. Both performers had calm but intense presences. Declan left the room with the full drum kit and large mirror installed.